Windows 10 Professional operating system, Black finish. Includes laptop, power adapter and user guide. Dimensions: 11.83"L x 8.37"W x 0.92"H. Weight: 3.1 lbs. 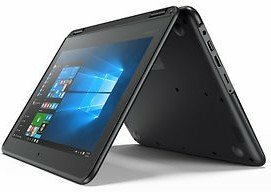 The Lenovo N23 laptop features a convertible body with a 360-degree hinge for easy switching between notebook and tablet modes. The 11.6" touchscreen and Intel dual-core processor make this laptop a powerful portable companion.